This is an nutritious muesli which is non heating and oat free, designed to maintain both horse and pony at rest or in light work. conjunction with suitable forage to ponies or horses. 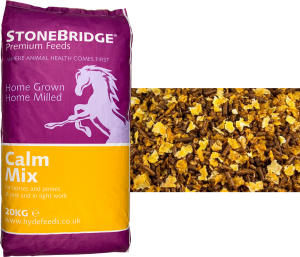 Specially blended for Stonebridge & designed for the health and mobility of the horse or pony. Containing the highly available Bioplex Organic Minerals and is rich in vitamin E & selplex. stable pH levels in the digestive system and helps to improve fibre digestion.